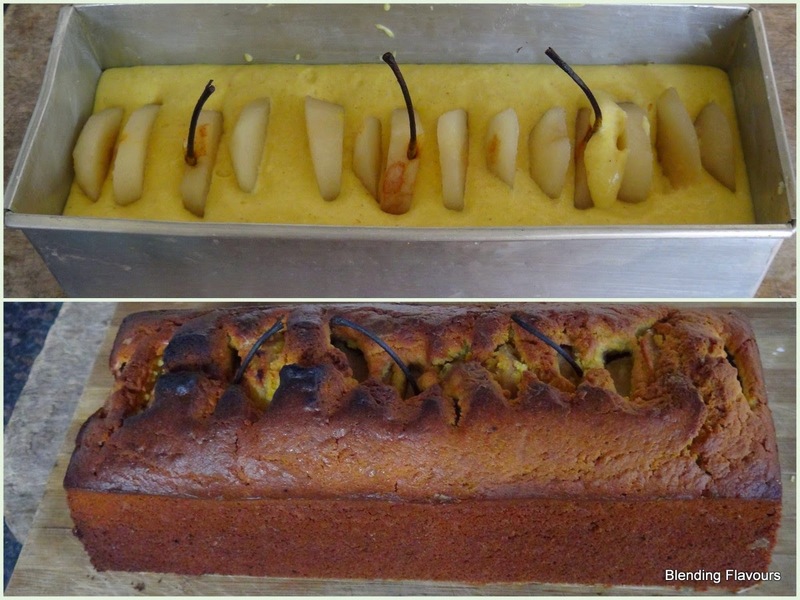 When I first saw the pear cake and pear loaf images on the internet I was completely bowled over. Of course I couldn’t wait to get started. But there were oranges, chocolate chips, spring onions and more ingredients patiently waiting for their respective turns. Looking up more Google images one recipe that I really liked was here. But I made some changes and came up with something similar to my recent post on coffee loaf with orange frosting. 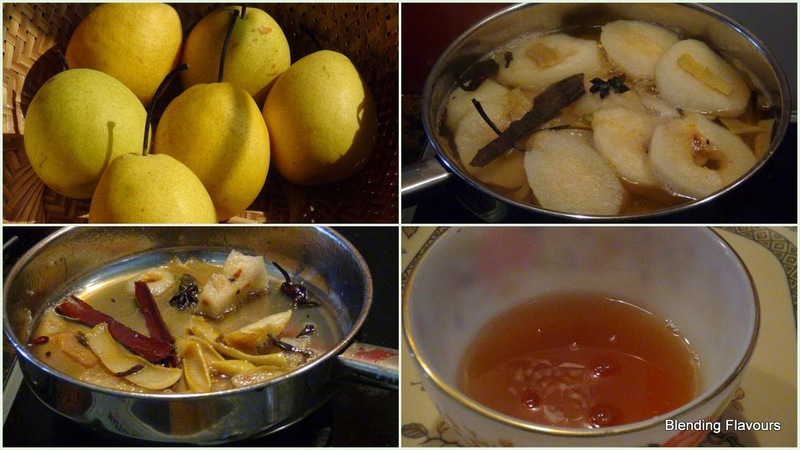 Clockwise: the golden pears, infusion, the reduction, boiling the peel/spices and chanting…thicken...thicken!! 3 pears, peeled, cored, and cut vertically. Leave the stalks on. Heat the water in a pan. Add all the spices and the sugar and let it come to a boil. Add the pears, cook for about 4 minutes and switch off the flame. Leave to infuse for about 15 minutes. Remove from the liquid and place them in a colander till ready to use. Put the pan back on the gas, add the peel and reduce till the liquid thickens. Strain into a bowl. Set aside till ready to use. A slice of pear for every slice that you cut! Heat the milk to near-boiling point. Remove from the flame and add a pinch of saffron. Leave to infuse. Sieve the flour with the baking powder and cinnamon powder. Line the base of the loaf tin with grease-proof paper and grease the sides well. Cream the butter and sugar till the mixture turns pale. Add the eggs, one at a time, beating well till fully incorporated. Add the milk and the flour alternately adding them in small quantities. Fold in. Repeat till all the milk and the flour has been incorporated into the batter. Transfer the batter in the tin. Put in the pears vertically. The idea is that every piece will have a slice of pear. Bake in a preheated 180C oven for about an hour or till a skewer inserted in the centre comes out clean. Melt the white chocolate in a double boiler. Add the cream and mix well. With a spoon, drizzle the mix all across the loaf horizontally. Let the mixture trickle down all across the sides as well. To serve, cut the loaf into thick pieces ensuring that a slice of pear is encrusted in that piece. Drizzle the reduced pear liquid over the loaf. Enjoy! !